Sarah Mali develops a conceptual framework for Jewish belonging that is built out of what she terms neighborhood and peoplehood attachments. She argues that Jewish personal and moral fulfillment requires actualizing and synthesizing both of these seemingly contradictory attachments. In Section 2 of the paper she applies the conceptual framework to the field of leadership development and presents a leadership training approach termed Jewish People Leadership for Jewish pre-professionals and professionals from North America, Israel and around the Jewish world. 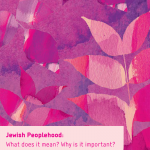 PreviousPrevious project:What is Particular and What is Universal in the Jewish People?NextNext project:Peoplehood Papers 13: What does Peoplehood mean? Why is it important? How do we nurture it?